Take Control of Your Energy Budget With Pre-Paid Electricity! TVEC’s Pay as You Go pre-paid electricity offers an innovative option to help members manage energy budgets. With email and text alerts, the My TVEC app and online account access, you can monitor your usage, add money to your account and receive regular updates. With Pay as You Go, paper bills, late fees and reconnect fees are eliminated. New or current TVEC members may apply for Pay as You Go service. A $50 minimum credit balance must be established. Electricity usage, monthly membership fee and any other charges are charged to your account as a prorated daily charge. Sign up for text and email alerts to keep up with your account balance and electricity usage. These alerts can let you know your daily usage, warn you of impending disconnection and help you keep up with your account balance. Payments may be made the same ways as traditional monthly billed members—online, in person, the my TVEC mobile app or over the phone. New Members – No deposit is required for Pay as You Go pre-paid electric service. Current Members – Any deposit that we have for your account will be applied as a credit on your account. For members who opt to change back to traditional billing, a new deposit may be required. New accounts are automatically enrolled in Operation Round Up, benefiting the TVEC Charitable Foundation. For more information click here. If you would not like to participate in Operation Round Up, you may opt-out at any time. Contact a member services representative or include instructions in the comments section of the online member application form. For more opt-out options click here. 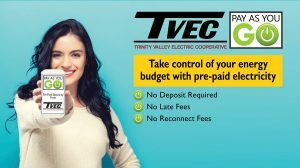 Contact TVEC Member Services for more information about Pay as You Go Pre-Paid Electric Service.